Yesterday, you learned about Print Areas – a time & paper saving feature of Excel. While print areas are great, you can only set up one print area per sheet. What if you want to print either report or data based on user selection? In such cases, you can set up dynamic print areas. That is right. See below demo to understand how it looks. Read on to learn how to set up dynamic print areas. In your spreadsheet, select any range of cells and create a print area (click on the link for instructions). Now, identify the all ranges that may be printed. To keep it simple, let’s say there are 2 such ranges. Give them names like report and data. Link the option buttons to a cell, say M8. Go to Formulas ribbon tab and click on Name Manager. You can see the Print_Area named range, pointing to the range you originally selected. That is all. Your print area is now dynamic. Please click here to download dynamic print areas workbook. Examine the formula for Print_Area named range to understand better. Your users can see something but print an alternative range (may be B/W compatible), with print areas. Your users can print reports at various levels – summary or detailed with dynamic print areas. How are planning to use dynamic print areas? How do you like this technique? Please tell me how you are planning to use dynamic print areas in your work. Post your comments below. Very cool. Thanks for sharing this Chandoo! Lots of possibilities with dynamic print ranges. This is also something that can be shared easily with end users (versus complex vba that may be harder to modify). Is there any way to impact other aspects of page setup (e.g., orientation, print titles, scaling) while doing this? If the two (or more) print ranges need to be printed with different headers, different orientations, etc., can that be accommodated? Probably not with this technique, but are there any other methods to deal with that through user selections? By the way, this is my first post/reply. Love the site, but I can't keep up with all of the great ideas! I truly appreciate what I've learned through your efforts, and the efforts of all of those that provide feedback and other great ideas. 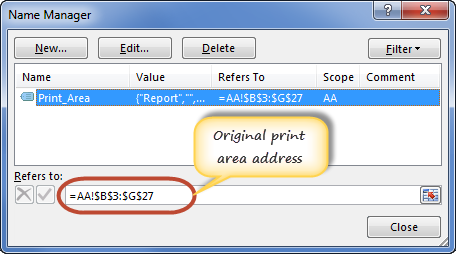 Your dynamic print areas would not be understand from after set print area to set in Cell M8. please explain in simple words. I have an interesting twist on your method based on simply using a drop-down list and indirect addressing. How may I sent you the workbook? Pardon, "send" not "sent" until I actually have done so. Some sites allow you time to revise your text after submitting which obviously has been helpful to people like me. The solution works well, until you change the Page Layout -> Orientation from Portrait to Landscape or back. 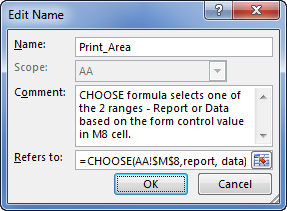 This replaces the CHOOSE formula that the Print_Area refers to with the actual cell range that is referenced. Now that the formula is gone, the Print_Area is no longer dynamic. Do you have any ideas of how to overcome this? How do you create the radio buttons on the worksheet?